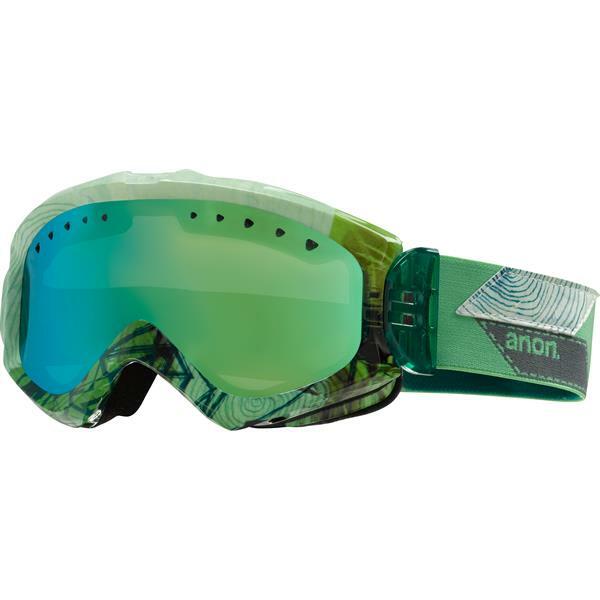 Keep your eyes safe from the harsh winter conditions and blazing alpine sun in style this season with the Anon Majestic Goggles for women. With a lightweight TPU (thermoplastic polyurethane) frame and dual layer face foam, these goggles match the shape of your face for a perfect fit that seals out the elements, and with full perimeter venting, you won't fog up riding in wet conditions. Absolutely love these ! They are great for sunny days and fit on my helmet perfectly ! I can not recommend these enough. Great fit and great product! I haven't worn them on the slopes yet but they are VERY comfortable and fit well. BEST ANSWER: Yes the Anon Majestic Goggle lenses are interchangeable. One lens came with goggles. Why change lenses? Are these for low light/night skiing or full sun day skiing? BEST ANSWER: The Anon Majestic Goggles that feature the Green Solex Lens are designed for bright sunlight conditions. The Green Solex lens has a 17% VLT. They work great for either! BEST ANSWER: Anon goggles have 100% UV protection. Unfortunately, we are sold out of this model. What are the replacement lenses for these googles ? BEST ANSWER: Anon has discontinued the Majestic goggles, finding replacement lenses may be challenging. Anon does not currently list Majestic replacement lens types. Is this really not helmet compatible ? BEST ANSWER: The Anon Majestic Goggles are helmet compatible.